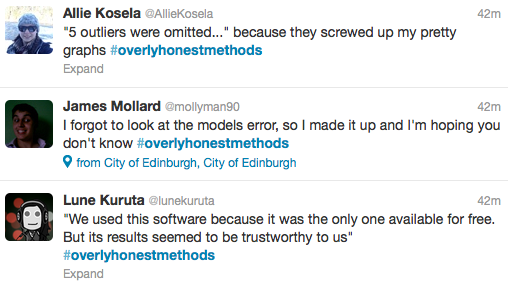 Since the first #overlyhonestmethods hash tag was used on January 7, 23 tweets include concerns or jokes about reproducibility. I summarize them here. 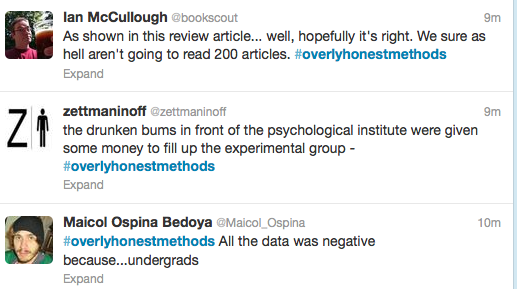 Tweets including “replication” are here. I just wrote something about this too (maybe more from a biological/health science point of view). Thanks for sharing the collection. Hi, “Bookscout” here and I would like to unpack my tweet a bit. My jab was at review articles and how they tend to be used as a reference instead of people bothering to track ideas to the origin. Fair enough, but a substantial review with 200 references is an enormous amount of labor to create – typical scientists read (and by this I mean read every bit, not skim) about 250-300 articles a year (I believe this is from a Tenopir/King paper). Lack of time and need for a concise summary is why reviews exist (and perhaps as a way to get easy citations for young scholars). So it’s a bit lazy to cite a review, but social scientists are pretty happy to cite a well-written academic book instead of going to the primary texts on which they are based, or the many journal articles that get cited along the way in a book. I’m a librarian now, so citation analysis and the gap between what influences and what is actually cited is one of my personal hobbyhorses. Your overall mission – more replication – is truly noble. I wish you the best of luck. This makes me feel better about my masters thesis. Apparently, not many of us know what we’re doing.